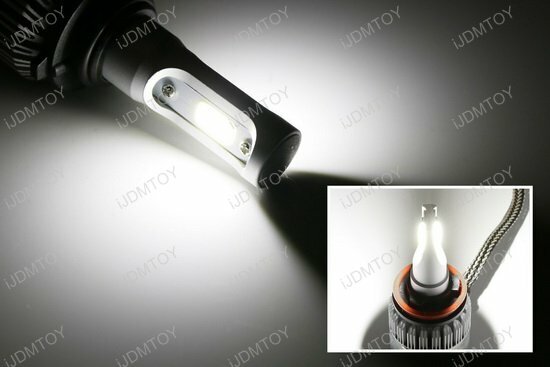 Q: Is this LED headlight bulb polar sensitive? A: Yes, the adapters in this LED headlight bulb are polar sensitive. 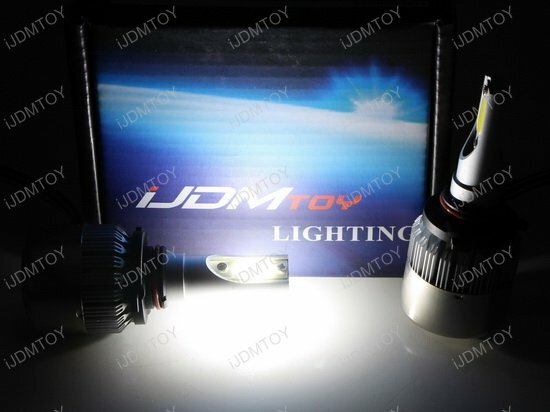 Make sure you connect the adapters in the correct orientation in order for the LED headlights to light up. Q: How do I know if there is enough room to install the LED headlight bulb? A: You'll need to make sure your car has physically enough room to accommodate the LED headlight bulbs inside of the headlight housing. Make sure that the headlight housing has enough room for both LED bulb and fan in the back. Q: I can hear the fan circulating. Is this normal? A: Absolutely, since you can hear the fan of the LED headlight bulb circulating, that means that the LED headlight bulb is working and functioning. 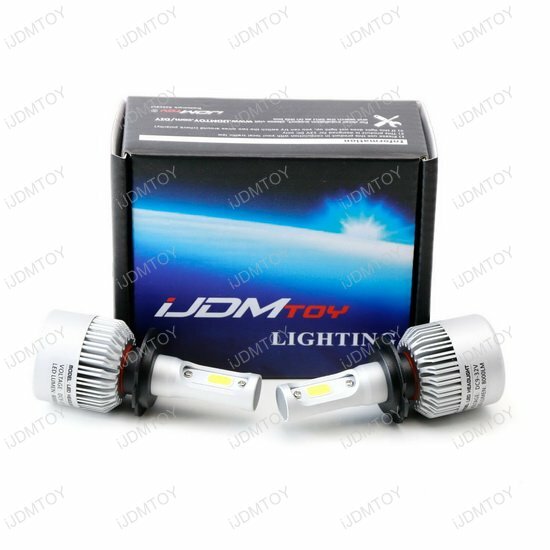 Q: Is there any maintenance I need to do to make sure my LED headlights work? 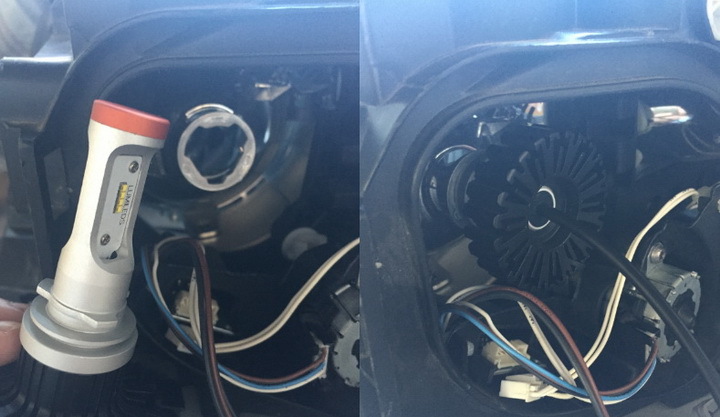 A: Every 3-4 months, it's a good idea to take one of those air canisters and blow some air into the fan portion of the LED headlight bulb to clean out any accumulated dust or debris. Q: What if my stock rubber caps won't fit over my new LED bulbs? 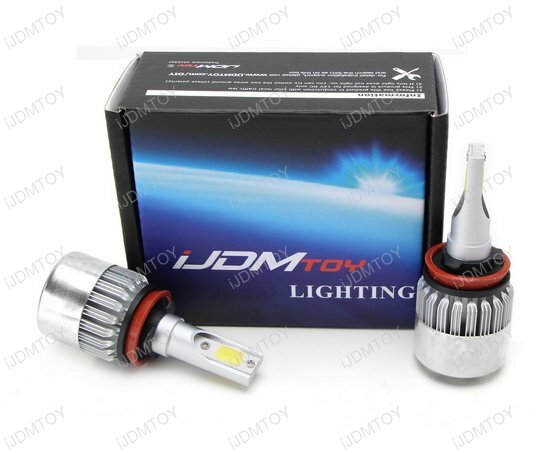 A: If your new LED headlight bulbs are too big for the stock rubber cap covers, swap them out with the iJDMTOY rubber cap covers which are capable of accommodating larger bulb bases. These cap covers are made with high quality flexible rubber that is ideal for sealing your aftermarket retrofit LED assemblies from water condensation, moisture, dust, and other unwanted substances. 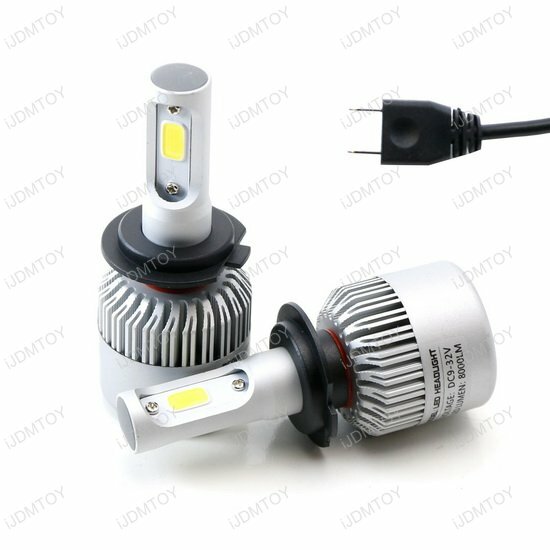 Q: How do I install these LED headlight bulbs? 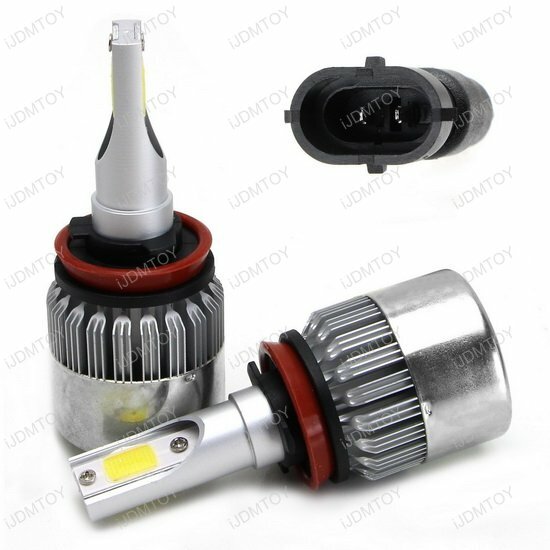 Directly install the new LED headlight bulb and twist to lock. 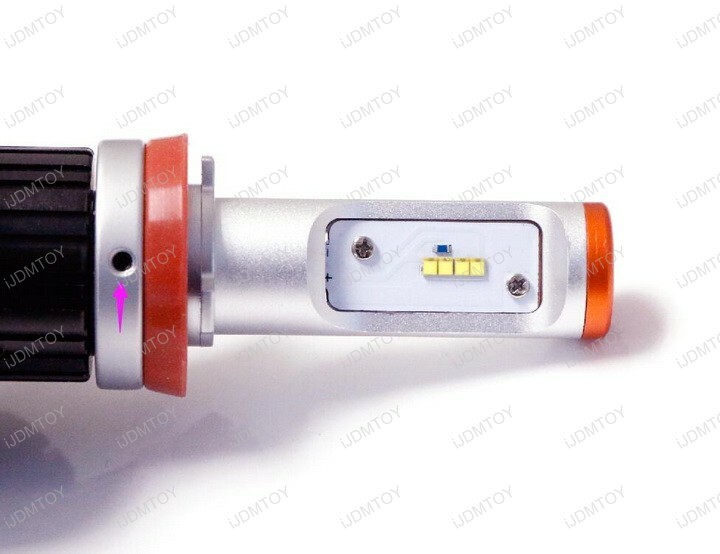 Insert the detachable bulb base first and then you can install the LED headlight bulb. 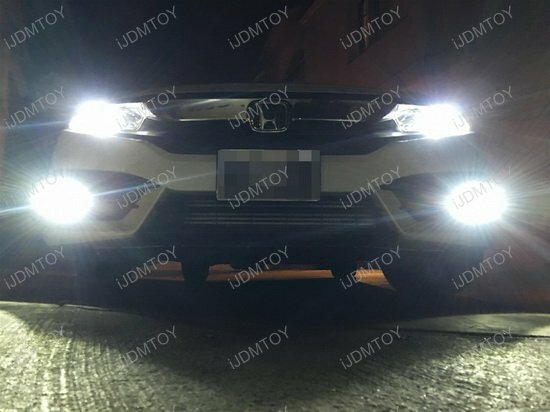 Q: Why do my beam patterns look a little bit off, or one looks dimmer than the other, after I install the high powered LED headlight bulbs? A: The reason your beam patterns and brightness may not look the same on both sides is because the bulb is not set to the ideal rotation. If you look closely at your LED light bulb, you can see that there's an alignment scale on the tab. This alignment will need to be adjusted in order to fix the beam pattern. To match your beam patterns and brightness, use the included hex tool to loosen the LED bulb from the base and turn it until the alignment is perfect. Tighten the heat sink base to the LED bulb to finish. 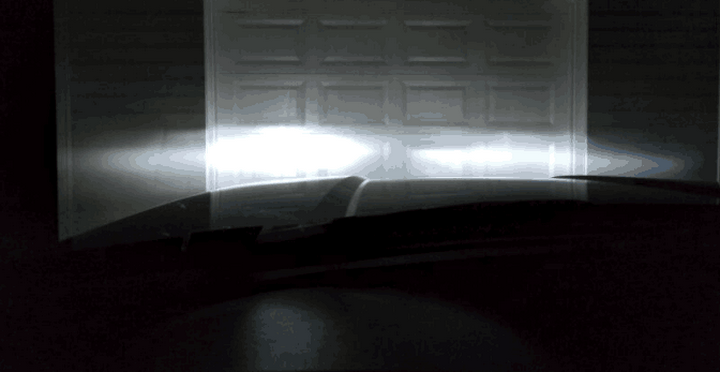 Q: Why do my LED bulbs keep flickering when I start my engine? A: The LED bulbs are more sensitive to power, so LED light bulbs in some European and US vehicles will still experience flickering. If this is the case for you, you will need to purchase a set of CAN-bus decoders to prevent the flickering. Q: Why am I getting "bulb out" warnings on my dashboard? A: These LED bulbs consume less power than stock bulbs, so on some European vehicles the LED light bulbs will trigger the onboard computer bulb out warning. If this is the case for you, you will need to purchase a set of load resistors to increase the total wattage. 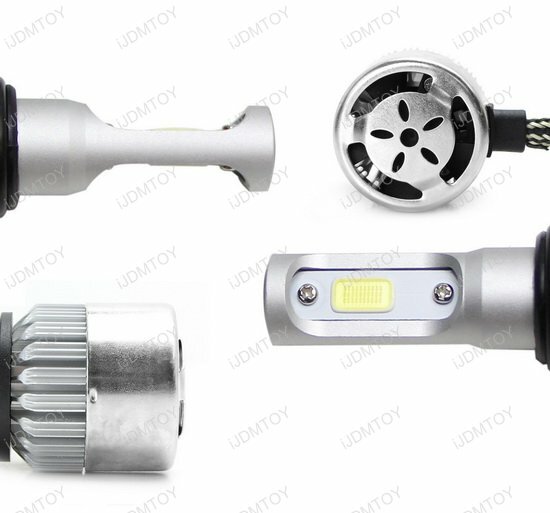 Q: The H11 adapters on the LED headlight bulbs look different from my H11 halogen bulb's adapters. Will this still fit in my headlight harness sockets? 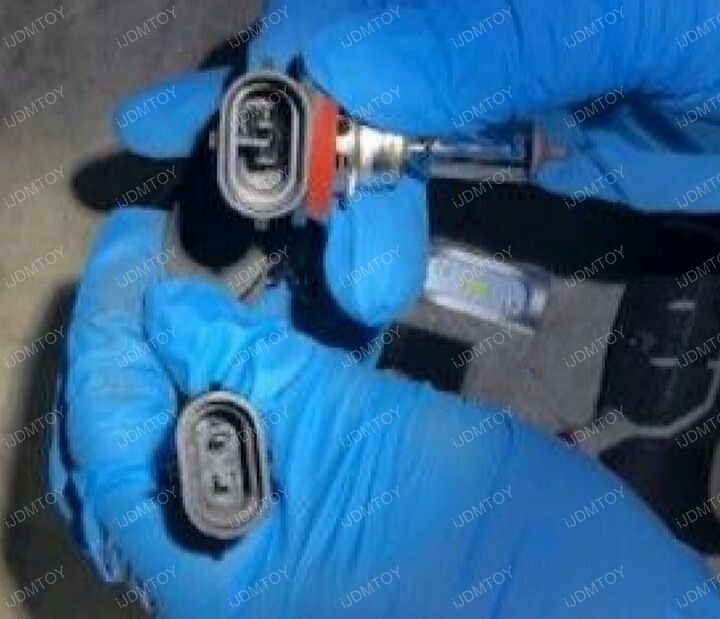 A: The LED headlight bulb's adapter do look different from your halogen bulb's adapter; the LED bulb adapter is missing the locking tab on the sides. 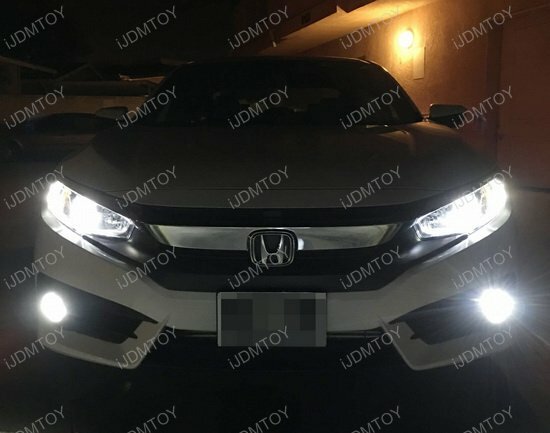 This is an intentional design that will allow you to plug in the LED headlight bulbs in either direction if one way doesn't result in lighting up. 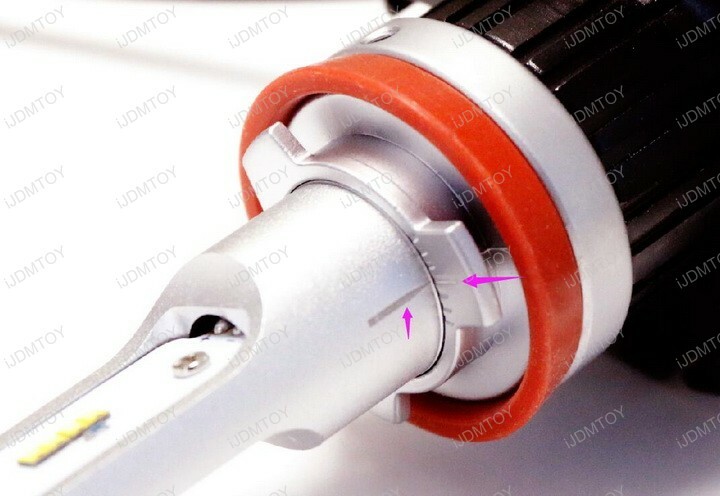 This headlight bulb adapter design also applies to the 9005, 9006, and H10 sized LED light bulbs. 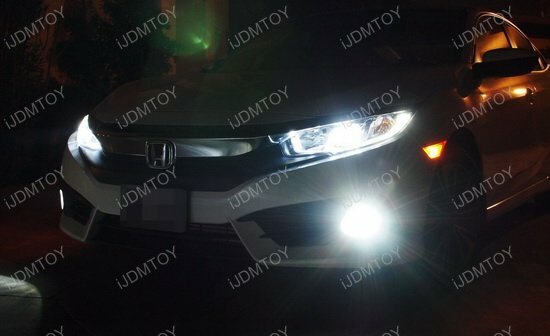 Q: How do these LED headlights look at night? 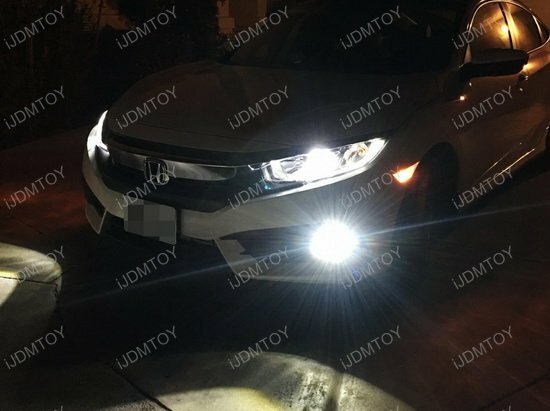 A: Check out the second half of our video below (at the 3:05 timestamp), which shows one of our customers driving at night in his BMW i3 with our LED headlight bulbs installed. 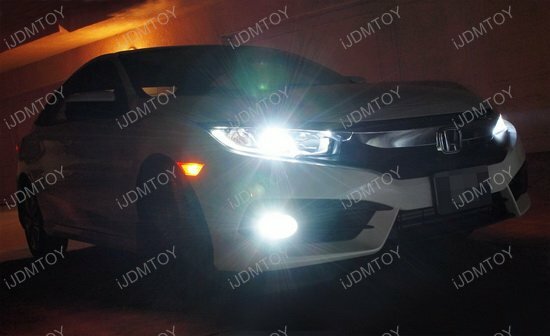 This page features a pair of C6 high powered COB LED headlight bulbs in a gorgeous 6000K xenon white with premium 8000 lumens (4000 lumens per LED bulb) lighting output. Each LED bulb comes with a fan heatsink to dissipate heat so you can prolong the lifespan of your LED bulb. The specially designed shape is crafted with perfect precision, giving your LED headlight bulb the optimal beam pattern to project light outward and give you superior visibility. The adapters are polar sensitive. 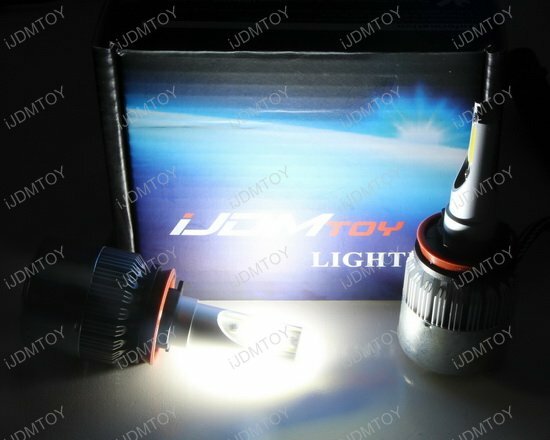 Make sure that you connect the adapters in the correct orientation in order for the LED headlights to light up. Make sure that your headlight housing has enough room to accommodate the LED bulb and the fan in the back. After installation, you will hear the sound of the fan circulating. This is normal and means that your LED bulb works accordingly. For maintenance, clean the fan every 3-4 months with an air canister to blow out any dust or debris that has accumulated in the fan. This maintenance prolongs the lifespan of the LED bulb.